“God’s Healing Power” from Christian Faith Publishing author Nikki Holmes is a six-week course in giving it all to God, enabling the reader to connect deeper and strengthen one’s faith in God’s healing power. “God’s Healing Power”: an introspective journey designed to strengthen and grow relationships with God. “God’s Healing Power” is the creation of published author, Nikki Holmes, a teacher and counselor with a passion for family and working with children. Published by Christian Faith Publishing, Nikki Holmes’ new book is an introspective look at one’s relationship with God. All people experience trouble on some level throughout their lives. In fact, God’s holy word guarantees that hard times will be had. Sometimes, these hard times become so overwhelming that people feel out of control. Drowning in circumstances, the focus on God can get lost. Throughout this six-week study, the reader will begin to see or remember who God is. The reader will be reminded of God’s promises and love, relationships with God will grow deeper and faith will become stronger. God will begin to remove the stumbling blocks of doubt and fear. True freedom will be found by giving everything to the God of the universe. It is difficult to trust in this world. So many times people are let down by others in this life. Dive in head first to this six-week journey and begin to experience the real freedom that comes from experiencing God’s healing power. View a synopsis of “God’s Healing Power” on YouTube. Consumers can purchase “God’s Healing Power” at traditional brick & mortar bookstores, or online at Amazon.com, Apple iTunes store, Kobo or Barnes and Noble. 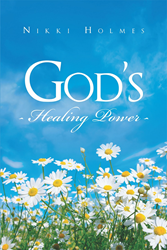 For additional information or inquiries about “God’s Healing Power”, contact the Christian Faith Publishing media department at 866-554-0919.